ABC Breaking News Alert: Gillard takes power in bloodless coup. June 23rd., 2010. The Drum: Leadership challenge: how has it come to this? Julia Gillard has been elected unopposed to the Labor leadership, seizing power in a bloodless Parliament House coup after Prime Minister Kevin Rudd decided not to contest this morning's leadership ballot. Ms Gillard will now be sworn in as Australia's first female Prime Minister. Emerging from this morning's meeting, she said she felt "very honoured" and said she would be making a statement shortly. 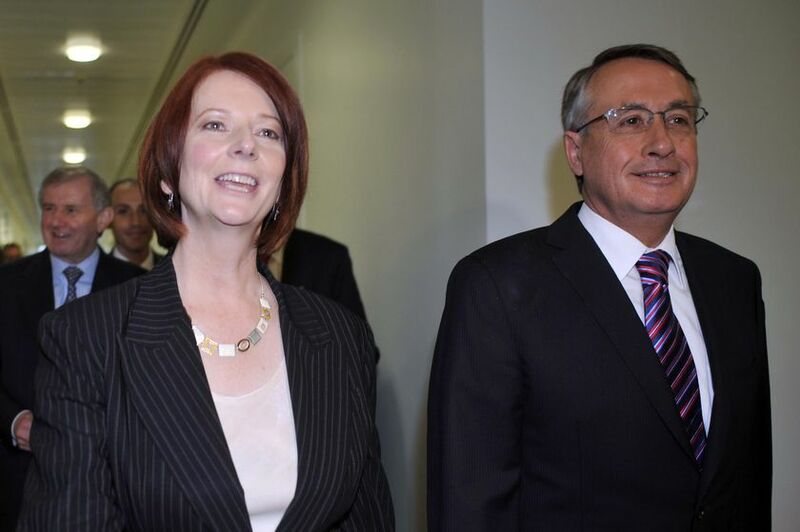 Treasurer Wayne Swan now steps up as Deputy Prime Minister. He was also elected unopposed. A stony-faced Mr Rudd left the meeting in the company of Labor stalwart John Faulkner. Ms Gillard now has the task of leading a traumatised and divided party to a federal election which could be held in a matter of weeks. Mr Rudd's sudden and spectacular downfall makes him the first Labor prime minister to be dumped from office before completing a first term. The situation came to a head last night after senior factional powerbrokers from the right told Ms Gillard she had enough support to take the leadership. The powerful Australian Workers Union and Health Services Union also quickly swung their support behind Ms Gillard as Mr Rudd's support base collapsed. After hours of crisis meetings last night Mr Rudd emerged just after 10:00pm AEST to announce that Ms Gillard had challenged him to a ballot and that he would also stand. For months Ms Gillard had said that she was not interested in challenging Mr Rudd but as events charged ahead last night it appeared she was left with no choice but to throw her hat in the ring. As the numbers were crunched it became clearer that Ms Gillard was going to prevail, with supporters on both sides agreeing that she would win. Mr Rudd's fall from the top has been swift, as his popularity among voters fell from stratospheric highs to disastrous lows in just a few months. Voters lost faith in Mr Rudd after a series of bungles and backflips, including the shelving of the emissions trading scheme. Last night he had vowed to fight to remain in office saying the Australian people had elected him, not the Party's factional leaders. An undersea accident has forced BP to shut down a key system collecting oil from its blown-out Gulf of Mexico well, unleashing a torrent of oil, the top US oil spill official said. The local share market has surpassed the slide on Wall Street overnight, losing 1.6 per cent. Australian stocks have continued to fall for a second day, after a negative lead from Wall Street overnight. Are health insurers raising rates ahead of new law? We all know the housing market crashed a few years ago and has been in the doldrums ever since. And we all know that's why Congress enacted the home-buyer tax credit a couple of years ago. It's also why new-home sales fell of a cliff in May, after the April tax-credit deadline to sign on a purchase contract (home buyers have until June 30 to close on a home). Read Rex Nutting's Economic Report today for more on those figures. But what no one really knows yet is just how much fraud is running rampant in the home-buyer tax credit program. A report out today points to fraudulent tax-return claims worth $27 million to scammers -- including some people serving life sentences in prison who claimed the credit. But the report also said that investigators unearthed evidence of other cases that total "tens of millions" dollars in fraud, in addition to the $27 million. They're just not sure, yet, exactly how many tens. And that's only for 2008 tax returns. Can't wait to see what the 2009 and 2010 claims look like. One particularly interesting fraud case cited in today's report: A single home was claimed by 67 different "first-time buyers." Also, a few IRS employees apparently claimed the credit when they were ineligible, i.e. not first-time buyers. Way to promote trust in the system, guys. Meanwhile, some say honest taxpayers who filed for the credit are waiting months for that check to arrive -- and that's cash that might help a bit to stimulate anemic consumer spending. Think of all the home renovations that could be made if the tax credit got quickly into new homeowners' hands. Then again, maybe the delays are because the IRS has started taking a closer look at claims. That, in the end, would be a very good thing. The Internal Revenue Service doled out more than $27 million in fraudulent claims for the home buyers' tax credit on returns for 2008, including claims by prisoners serving life sentences and people who purchased their home before the credit was in effect, a U.S. Treasury Department report said Wednesday. Sales of new single-family homes plunged 33% in May to a record-low level after a federal subsidy for home buyers expired, according to data released Wednesday by the Commerce Department. As House and Senate negotiators continue to work differences in their versions of bank reform, a House proposal to have $3 billion used to help unemployed homeowners avoid foreclosure may prove to be a sticking point. See story on lawmakers hit sticking point on aid for unemployed homeowners. Lawmakers have been busy ramping up consumer protections on a variety of financial products, but are we saving any money yet? Already banks are fighting back with new fees and other changes to your accounts. MarketWatch's Andrea Coombes looks at some of the changes banks are making to account terms and fees. House and Senate negotiators agreed Tuesday to create a strong and independent consumer protection bureau as part of sweeping financial regulatory reform legislation. See story on negotiators back independent consumer bureau. House members of a conference committee seeking to work out differences between two bank-reform bills on Wednesday agreed to drop their demands for a $150 billion fund to be used to dismantle a failing mega-bank so its collapse wouldn't damage the markets. See story on lawmakers drop demand for bank fund. The CEOs of America's largest companies expect sales and hiring to rise over the next six months, but they don't plan to spend as much and they remain worried about the health of the U.S. economy. See story on business leaders still cautious about the economy. As they wrap up a two-day meeting to review the U.S. economy, interest rates and monetary policy, Federal Reserve officials are expected to issue a cautious statement keeping rates on hold at record-low levels, analysts said. Oil prices may rise to $86 a barrel by the middle of this decade, representing an increase of nearly $10 a barrel, or about 13%, from current levels, the International Energy Agency said Wednesday. See story on oil prices expected to rise. If you're facing a substantial premium increase just to keep your same health plan, do you choose to swallow hard and pay it or switch to one with skimpier coverage -- say, a higher deductible or other out of pocket costs? See Kristen Gerencher's Health Matters Blog. Russell Investments recently posted a list of companies joining and leaving the Russell 3000 index on June 25. In anticipation of this event, many investors have either bought the stocks of companies being added to the index or sold those being deleted from it. Big mistake. See Robert Powell's Your Portfolio. You can learn a lot from watching the World Cup-and not just about soccer. As I've tuned into the games I've started to realize how many ways it's just like the stock market-and how it can actually teach you a useful thing or two about making money. "I've just moved my retirement portfolio into cash," a friend told me late last week. Like millions of folks, he was tired of the market's pernicious volatility and wanted to play it safe. The killer virus that is stalking the economies of the United States and Western Europe got its start in the aisles of Best Buy Co. It will die there too eventually, but not yet -- not even close. Was that all there was to gold's new all-time highs? If so, it was a big disappointment. After gold rose last Friday to new all-time highs, and then rose slightly higher still early in Monday's session, the metal quickly reversed itself -- ending Monday's session with a big loss. When you're paying for life insurance, you'd like to know you're getting a financial break for slogging away on the treadmill or kicking the smoking habit. Bob Pisani reports on the trading day from the NYSE. Mad Money host Jim Cramer gives his takes on the Fed decision and markets. The Federal Reserve decides to keep Fed funds rates unchanged. Insight with Ken Volpert, Vanguard Funds; Bill Gross, Pimco co-founder; CNBC's Steve Liesman & Hampton Pearson. President Barack Obama says he accepts General Stan McChrystal's resignation with regret and nominates David Howell Petraeus to replace him. Discussing the smartphone showdown between Google and Apple, with John Stratton, Verizon CMO; Eric Schmidt, Google CEO; Sanjay Jha, Motorola CEO; Shantanu Narayen, Adobe CEO; and CNBC's Dennis Kneale. Among the companies whose shares are expected to see active trade in Thursdays session are Discover Financial Services, Research in Motion and H&R Block. Rotten Apple, or Just Sour Grapes? Once dismissed by larger, more successful companies, Apple now finds itself in the bewildering position of being viewed as an anticompetitive industry bully. Sales of new single-family homes tumbled more than expected as the effects of a tax credit faded. House negotiators working on an overhaul of the financial system agreed to leave out a $150 billion fund that would have been used to liquidate large institutions. Robert Dudley has plenty of experience dealing with a hostile government and angry citizens. [BRIEFING.COM] Mostly muddled trade ended in a modest loss for the S&P 500 as the worst new home sales figures on record acted as a drag on trade and the FOMC failed to deliver any positive news to market participants. Stocks set their session lows in the early going as it was reported that new home sales for May fell almost 33% month-over-month to an annualized rate of 300,000 units. Not only was that far below the rate of 430,000 units that had been expected by economists polled by Briefing.com, but it was the lowest rate since records began more than 45 years ago. Though the stock market was able to trim its losses, it didn't make its way into higher ground until the afternoon release of the latest policy statement from the Federal Open Market Committee (FOMC). The FOMC maintained the target range for the federal funds rate at 0.00% to 0.25%, as expected. It also stated that exceptionally low levels of the federal funds rate are expected for an extended period. Once again, Thomas Hoenig voted against the decision to keep the interest rate target unchanged. He also argued against the language about keeping exceptionally low interest rates. Though the FOMC included in its statement the observation that economic recovery is proceeding, it also stated that financial conditions have become less supportive of economic growth on balance. The stock market's upward push during the minutes that followed the FOMC statement proved short lived, mostly because it lacked any sort of real leadership. In turn, stocks spent the rest of the session stuck in choppy trade with moderate losses. The Federal Reserve isnt panicking about the recovery, but its not very happy about the pace of growth. The Federal Reserve keeps interest rates on hold at a record low near-zero for the eighteenth straight month and says the European debt crisis was negatively impacting the recovery. The Federal Open Market Committee released the following statement after its closed-door meeting in Washington. to economic growth, including "developments abroad." in housing and consumer spending. speaking, of course, about the forex market. Exchange (CME), as they are all tradable. play out in the future. As always, our videos are free to watch and there is no need for registration. Please comment on your thoughts on this market. See the CFTC Press Room for the latest news and events or Press Room Archives for previous releases. New Home Sales Tumble Sales of new single-family homes dropped 33% in May to a record low in May as the boost from a popular tax credit faded. Is the World Broke? The billionaire said German's budget savings policy risks could collapse the euro. Disappointing data on new home sales sent Wall Street further into red territory. Bob Dudley is now in charge of clean up as the head of the Gulf Coast Restoration Organization. The phone reportedly sports chips from Samsung, Micron Technology and STMicroelectronics. Lawmakers spared auto dealers from new scrutiny and neared agreement on trading limits for banks.